Winter is over, but we can see snow around us. And we need to clean it up even now. Today our language will be about one of the main representatives of snow-removal equipment for the home, namely a household snow blower and its buying guide. A home snow blower (thrower, cleaning machine) is a special device intended for snow removal in certain areas, by its capture, shredding and release in the given direction. Depending on how blowers move, they are self-propelled and non-self-propelled. A non-self-propelled blow machine is a mechanical device that moves due to operator’s movements. A self-propelled snow blower moves independently, which allows it to get close to its class to motorcycles or even mini tractors. 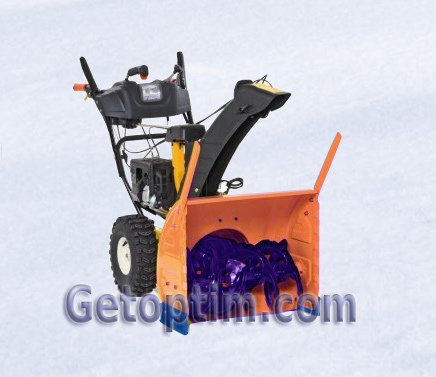 The non-self-propelled (portable) snow blower has smaller dimensions and weight, so it is easier to use it in areas where there is no particular opportunity to “roll over”. This type of snow blowers is neater to the cleaned surface. On the other hand, with non-self- propelled device it is difficult to remove frozen snow with a large height. A self-propelled snow blower can move itself, while it can remove snow of any density in sufficiently large areas, but it is more expensive. For a small summer residence or house it is possible to recommend to buy a non-self-propelled blower, it will carry work out and will cost relatively inexpensive. 2. Type of snow blower engine. There are two main types of snow blowers depending on the type of their engine, as chainsaws – gasoline and electric. Electric snow-blowers are mainly non-self-moving machines which use electricity for their power supply. They are characterized by relatively small engine power (about 2-3 horsepower) and a fairly large compactness. Gas snow blowers are characterized by greater engine power (up to 10-15 HP), they can be both self-moving and non-self-moving. What snow blower to buy – gas powered or electric? For ordinary household needs, you can buy an electric snow blower – it will help to remove a relatively small area, where there is access to the electrical network. If there is no normal access to the electricity, or you need to clean a relatively large area – it is better to choose a new gas snow blower or battery powered cordless electric blower. A snow blow machine can be started by manual or electric start-up. A manual method involves pulling the handle. With the electric start, a blower starts with a special electric starter, which operates on the built-in battery or power grid. An electric start is more convenient, but manual – more reliable, especially in the winter. The time and efficiency of the work with a blower depends on the parameters of its snow capture. These parameters include the width of the capture and the height of the capture. The width of the capture is the width which a machine cleans in one pass. If this width is bigger you will spend less time to clean the desired platform. In most electric and mini non-self-moving gasoline snow blowers the width of the capture fluctuates within 30-55 cm. Medium-size and large professional snow blowers can have a capture width of 60-80 cm. A capture height is a height of the snow cover that can be handled by the machine, in other words – it shows how deep snow should be to use a blower. This indicator is more homogeneous for different models of blowers and is within 40-50 cm. We think it’s clear to everyone that it’s hard to overpay for an extra 5-10 cm height or width, although may be someone like that. Range of emissions. In cheap models it can be 1-4 meters, professional blowers can throw snow at a distance of 10 meters or more. Snow blower light kit. If you want to remove snow at night – the possibility of a machine with a headlight will be quite appropriate. Handle heating. This feature allows to warm operator hands during the working. We can recommend paying attention to such good snow blower manufacturers (brands) as Husqvarna, MTD, Snapper or from the cheaper – Patriot. Well, we wish you to choose the best home snow blower for your house, and snow removal with it should be a pleasant and not hard work for you.